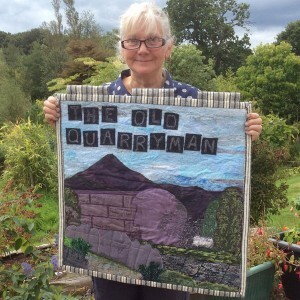 Gill made her quilt as part of her City and Guild course .The quilt is based on a poem by Ieuan Lewis called ‘The Quarryman’, and brings together Gill’s love of history, poetry and affinity with the working classes. She introduces her quilt and reads the poem it was inspired by, then talks about how she got into quilting. Later she discusses the quilt in detail explaining how it incorporates a variety of techniques and some experimentation. The second half of the interview explores on her work with quilt groups, visiting quilt shows and a quilt on the theme ‘London Underground’ she was asked to make to represent Region 12 (South and Mid Wales) at a national quilting event. Millie Thomas [MT]: I am sitting with Gill Callaghan at Cilgerran. It is 21 August 2014 and Gill’s ID number is TQ.2014.022. Gill, thank you very much for coming to Talking Quilts with me. Gill Callaghan [GC]: It’s a pleasure. MT: Tell me something about what you brought and why you brought it. GC: I decided to bring my project for my City and Guilds 3. 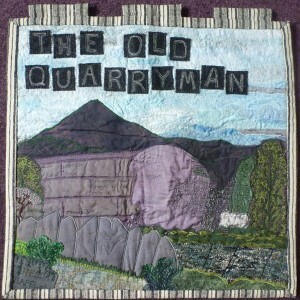 GC: It is a quilt that was based on a poem by Ieuan Lewis called The Old Quarryman. MT: Do you want to read the relevant parts or do you want to read all of it? Watching his life at the close of his day. Catching his breath as he stumbles along. There is dust in his lungs from the rocks of the ages. Death in the mountains I knew it was wrong. Faces as grey as the slate they would gain. Corris, Ffestiniog all tunnelled and torn. Mountains of slate that are bare and forlorn. MT: Gosh, it is very moving, isn’t it? MT: When did you make that? MT: With your City and Guilds. Did you go a class for that? I can’t remember. GC: No, I did distance learning down at GlosCAT [Gloucester College of Arts and Technology]. MT: Did you find that useful? GC: Very useful. I think it gives you all sort of building blocks almost for quilting. MT: Had you been stitching before you did the City and Guild? 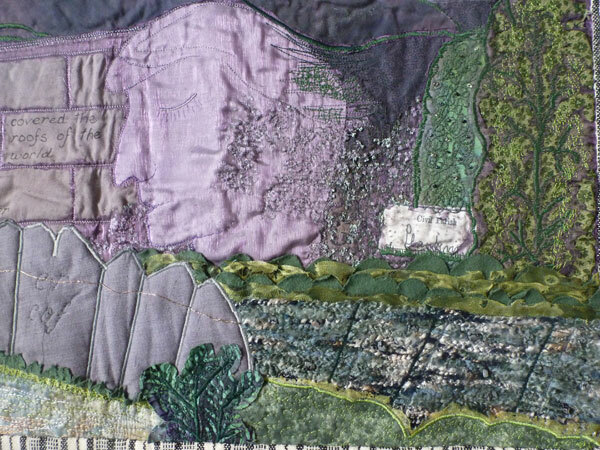 GC: I think I have been stitching all my life, as most of us quilters have, but I had not really start quilting I think I went to Malvern Show, and picked up a GlosCAT’s leaflets and thought this is what I want to do. It is a way of starting as a hobby and it has gradually taken over more and more of my life. MT: Can you remember the first thing you made? MT: Did you stitch as a child? Did you make dollies and everything. MT: Did your mum stitch? GC: Yes. She had an old singer sewing machine. MT: Wind up or electric? GC: Yes a wind one, a handle one she did everything on it. MT: She taught you to use a handle one. MT: Did she ever use a treadle? GC: No. I’ve had a go on a treadle, not very successfully. It took a knack [MT: It’s difficult]. I think once you get going you, probably like driving a car, you would be fine. MT: So you and your mum sat together and stitched quite a lot. GC: Yes. I had an Aunt who was a WI [Women’s Institute] Denham College teacher and unfortunately I was always pitched against her standards so, I probably had a more contemporary approach which my mother sort of couldn’t see and sort of thought that I was never as good as Auntie Nell. So I guess it got put away a bit and then Auntie Nell’s daughter was equally as good but then I learnt with quilting there is a space for everyone, you can just do it, it doesn’t matter, as long as whoever you make it for appreciates it and you like it, it does not have to compare with anything. MT: So you felt inhibited then by Auntie Nell. GC: Yes, I did a bit, although I still admire her work. It was immaculate everything she did was absolutely, but it just wasn’t quite what I liked. I liked something a bit more naïve, a bit more folkie, I liked possibly not in reflection [laughs]. MT: Well it would be difficult to live up to that. GC: Yes, so I probably did the right thing by stepping away. MT: And at school you did the needlework there. GC: At school I did a lot of art. MT: Where did you go to school? GC: North Wales in Denbighshire to a private school. I went to Grey Coates to start with which was where I did the smocking and then I went up to Clarendon in Denbighshire and I did a lot of art there but I did make a puppet the ace of spades for my GCSE or GCE as it was then. MT: Have you still got it? GC: No unfortunately it got lost somewhere along the lines, but yes. MT: So you left then. Did you stitch after that? MT: Oh, how disappointing. Were you disappointed? GC: Yes I think I was but with hindsight maybe I wasn’t re, coming from a boarding school and things, maybe I wasn’t ready for it. Whether it would have been the right thing I don’t know there is no point looking back. I did secretarial work and that stood me in good stead. I had some nice jobs. I started off then with the children making cloth kits when the children came along. GC: Cloth Kits. Wonderful. Everyone loves them who remembers them. MT: They are still around? GC: Yes I made a cushion recently with skyscrapers on for my grandson just because I thought he would like it to just bring back memories I think. Cause Cloth Kits came away from the blues and pinks, baby pinks and baby blues didn’t they? [MT: Yes they did.] They brought dark colours in and stripes and things which up to then baby grows had not been around other than in white. MT: They were quite trendy. Interesting, and exciting and maybe that fitted in with the 60s revolution in our lives. GC: And a little bit more money I guess after the war years and the people struggling, I think that’s something I admire my parents for my mother used to make everything last, hems were turned up and up and up. It was good you learn from it. MT: Was there any difficulty about your creativity and costs when you were a little girl? If you wanted to do something if you did not have the fabric were you able to, was your mum able to get it for you? GC: Yes I think so, we would sort a way round it. I can remember making a pair of, as soon as I starting to get into fashion, we made some tartan trews [trousers] because they were fashionable. My mother must have got the fabric from somewhere I guess. I remember having tartan trousers. MT: It is quite an expensive hobby even in any decade. GC: I mean buying the fabric is actually more expensive than just buying the clothes isn’t it and you still got to make them but you have put your touch on it. GC: That wasn’t until fairly recently, about 14 years ago I came into it. MT: What did you do between that time? Did you do much stitching or was that about children’s things, household stuff. GC: Curtains and things, clothes a bit. I have always had a sewing machine so I have always done things but, no, fairly recently. I think my first bed-size quilt was done in a Judi Mendelssohn Workshop at Towy Quilters probably and I then did a small one which was ‘stitch and flip’. MT: Can you explain that in case anyone in the archive doesn’t understand. GC: You take a square of wadding and then you put, I am trying to think you caught me on the spot I think, and then you stitch it and then you flip it there and it is quilt-as-you-go so you have got your squares and you quilt-as-you-go with the binding, hard to explain. MT: Not something I have done. GC: It’s a nice functional little quilt for a spare bed. I managed to adapt it [MT: Quite quick?] Yes, probably within a week, two weeks it was ideal. MT: That is a Judi Mendelssohn Workshop about 14 years ago. Can you remember the colours? GC: The first one I did was butterflies which was literal stitch and flip. The second one was some green sort of fabric that was like New Englandy fabric it had cats and the little patchwork houses on the fabric and I managed to get them right so they flipped right for the course. GC: I suppose so I still have trouble with getting my points and things joining up. MT: But it matters, that they are joined up? MT: Matters to you I mean. GC: Yes personally I think, what I said to the girls I taught, I said ‘it is you who has got to live with it and if you can live with it don’t worry’, because some people don’t worry and some people absolute have to have it right. And I think it is up to you what you like. Because basically when people look at them they tend to look at the pattern more than… people don’t use magnifying glasses. MT: Okay. So after that you moved on from flip and stitch because I have seen a lot of your work, I have seen quite a few pieces. GC: As I say I am not famous. MT: Where did you go after that? GC: 2006 I think my quilting took off really when I joined Contemporary Group and I started doing the journal quilts. MT: Were you a Guild member before you joined CQ? MT: Can you remember when you joined the Guild? 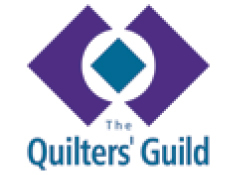 GC: Quite early, I think in relevance to when I started quilting I think I joined and I liked the magazines and trying to think when I went to, what I have done when I went to Scarborough AGM with a lot of the Towy Quilters which I think might have been 2008. MT: I can’t remember. So you were living in Caernarvonshire at this time? 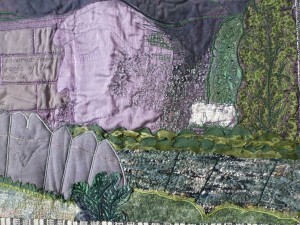 GC: No I was with, probably yes I have always lived in Carmarthenshire since I moved to Wales, which is about nearly 40 years ago, but a lots of different places in Carmarthenshire but it only since I have been in Hartford that I have been quilting then sort of that period in my life. MT: It became more serious at that point. GC: I think I did a degree in Lampeter in probably 1997 to 2000 and I guess it sort of opened my eyes to, there is a lot to learn, so obviously I was apply it to so I was able to apply it to City and Guilds when I did that in a way. MT: What was your degree? GC: Victorian study, hence my love of history so yes it all links everything links because obviously the working class had a hard time in Victorian times and it comes through with the quilts that I have been talking about really, yes. MT: And the poetry, where did your love of poetry come from because I know you use a lot of words in your work. GC: Yes I write poetry so it is quite nice to be able to use it I was particular moved by the CD which was from. MT: Tell me about the CD. I’ll pass it to you. GC: The CD was produced, I worked with somebody from North Wales and he used to go over to Ireland on holiday so it is a link between Ireland and, sort of, North Wales I suppose this gentleman, called Bob Squire, produced the CD that was actually recorded in County Cork and it’s a mixture of songs and readings that link to Wales to Ireland. MT: Is it in English? GC: Most of it is, interestingly enough, most of it in English, maybe that is so the Irish can appreciate I don’t know. My friend and Bob Squire are Welsh speakers but as I say I don’t know that. I was quite interested with Ieuan Lewis who actually wrote ‘The Old Quarryman’, because there is an artist called Ieuan Lewis over in Newquay on the. I just wondered if it was the same person, but I haven’t had a chance to look that up that worth looking up. MT: That would be interesting. GC: Yes because don’t know if he was from North Wales. Obviously there is copyright control on it. MT: So that fits with your love of poetry and cats, and as you call the struggles of the working class people. GC: Yes and of course, don’t ask me to say any but there is a lot of Victorian poets who did drew attention to the working class, I think Thomas Wood was one of them. MT: That is certainly a very moving poem that you used and I can see it coming through, tremendous. I have not seen it before. 0:16:36 GC: It is quite nice to bring something. MT: Something I don’t know. Tell me about the making. GC: I’ll start with the last bit which is the backing and everything I’ve used Welsh flannel which I thought was in keeping with it. I have been quite experimental on it I managed really I quite like I managed to put the wools [rummages for sketch book]. MT: You have got your whole working. MT: What did you stitch in the wool? GC: They’re beads that are from natural stone beads, I think that’s the embankment across the Croesor Tramway, with Cnicht on the left, which is the Mount Cnicht. I need a little bit more stitch there but, we are looking through I did some dyeing myself so I did simple dyeing procedure which fits in with the NVQ. MT: Look how you have decorated page. What wonderful writing you have got Gill. GC: Yes, it probably is. MT: I know fence and yes it is wonderful. GC: I tried to bring a lot of things that related to slate the roofs of the houses – houses and grey with the organza finish which gave a slightly misty sort of look. GC: That’s a copy probably of what I used census 1891. I have a plan of what it was going to, because I think we had to do that for City and Guilds. MT: And it’s exact isn’t it. GC: I didn’t put this in. Yes I sort of I really enjoyed getting it out and looking at it again, because although you move on your roots stay there don’t they and finally I think we had to do a costing page that’s the detail of it. I think I worked out it cost me £99.41 and my hours were 80 hours isn’t something you have to evaluate to cost it. MT: Well that is a lovely record isn’t and a beautiful piece and it goes fantastically well with the poem it is so moving. Are you still working in these kind of natural topics, environmental topics? GC: I hope to do journal quilts again this year. So, as I say, it would be nice. They keep coming through on different things but possibly, I suppose you move on a bit and you change. Sometimes I do practical things and I sometimes I do more creative things. MT: Do you work to a, I am thinking of your work with Brecon and various other challenges that you have been to , or do you work always work to an external demand or is it something from inside, I want to make a quilt on such and such. GC: I think it varies I think Brecon I regard I look forward to Brecon because it is something you can do creatively and you know are able to talk to people about what you do. I don’t like putting things in for competitions and things it just nice but equally I do make basic traditional quilts as well. I have just had one longarm quilted. I have done a chevron, a really bright chevron sort of, and I had Sarah Tosh to longarm quilt it because otherwise they tend to stack up don’t they because I still have my Kaffe Fassett waiting to be quilted. I must, sort of, I thought maybe give it to my son as a gift, that one. MT: What is your view about longarm quilting? I know it is useful. Tell me what you think about that. GC: Obviously it is an art skill in its own right, I think, how much is computerised I am not quite sure. I have not actually seen I wasn’t, some of the girls from Towy Quilters went to Sarah’s, and I wasn’t actually able to go at that time. I have not actually seen one working so I am not quite sure how computerised they are. MT: I saw one ten years ago at Drefach Felindre but I have not seen one since. GC: Because the one I have seen the person was actually doing it themselves but not sure. MT: I am not sure how upgraded they are now. GC: I think that as long as you always acknowledge it that is always important it depends how many quilts you want to turn out doesn’t. MT: I think that phrase turn out is interesting in itself, almost like we are doing it for a purpose as opposed to I feel moved about poetry and I want to make something around that or the loss of somebody or the birth of somebody, a celebration. GC: I think, I spend quite a lot of time quilting. MT: I was going to ask you about how much time you work. GC: I probably spent at least 3 days a week, full days, possibly more, obviously this time of year there is a lot to do outside, but going back to the longarm quilting I would not consider it on a contemporary piece of like wall hanging or something like that, or I don’t think I would, but I quite enjoy piecing together bed quilts for the family and I have quite a big family so if I can cut a corner with it being longarm quilted which possible makes it durable for washing and things then I am happy to go along with that personally. Certainly in exhibitions I’ve heard a lot of mutterings that people would like it clearer labelled on what is and what isn’t. I think I a lot of us could look and probably guess what is and what isn’t, but then you have got do you machine or hand quilt. You come down. Again there is a place for both isn’t there. MT: As you say it’s a skill itself. So it is something you consider for a more traditional kind of piece of work, quilt. GC: Starting to be more modern, that sort of… rather than tradition because traditional perhaps I would really prefer to hand quilt, I think. I have done a strippy and that I sort of appliquéd round I haven’t appliquéd, but stitched round templates to do the tradition house and birds and hearts and things in the strippy bits, it could probably do with a bit more quilting but I like the idea of hand quilting as well. MT: Do you get much time for hand quilting? GC: Yes I think it something you can always pick up isn’t it. I do quite, a few cushion covers that sort of thing. MT: Do you do that in the evening? MT: Like the light is always an issue isn’t it for hand stitching well I find it is an issue most of us do at our age. Okay I know that you, wait a minute looking at the crib sheet and it says, what do you enjoy about quilt making and is there anything that you do not enjoy, not that we are following the crib sheet, but it is the odd bit that fits in and then there is something else I want to talk about. GC: I wouldn’t say I don’t like I think but obvious the quilting part of the quilt is a challenge for me, [giggling] so hence why I decided to have one long arm quilted but, what don’t I like… I know one of the girls at the group says ‘huh I don’t like piecing because they don’t come together’. I think when you hand quilt it is slower but when you machine quilt, to get your seams to come right, can be a challenge but I do tend to try and I don’t think there is much about quilting that I don’t like. MT: When we talk about quilting do you, the first thing that comes to your head, do you think about the actual finished, the last the actual quilting of the three layers or two layers or do you think of the word in a broader sense. It is not on the crib sheet. I was just thinking about our conversation. I can never decide because, it covers so many things, but quilting is actually the last thing you do apart from the binding isn’t it. When you are talking about it do you think of quilting as the last part or the whole process from the beginning to the end of the piece. GC: I think we can use it as the whole process can’t we. We say we are quilters and yet really we are probably patchworkers, stitchers and everything. Stitchers actually probably covers more but, literally, it is the last part isn’t it. You are absolutely right, by the time you have got it together you look at it and see what different methods would actually enhance the design that you have put on. And you can mix it as well can’t you? MT: With this quilt you have gone, I know it is for the City and Guilds and that is kind what you had to do, do you do that now so you plan the thing from the beginning and finish the planning before you start stitching. In other words do you resolve the piece before you make it or are you more of an ad hoc person? GC: I am terribly on the back of envelopes rather than sketch books. I do sort of start doodling like when I did the London Underground piece that started all coming together and I try and brainstorm everything I do find that helps because you start getting a picture and you start drawing things in. Obviously with the London Underground it was light and dark that was my one thing, and up and down. So I start planning and then suddenly more and more comes in. Sometimes you wake in the night don’t you, somebody gave me fabric yesterday and I suddenly woke in the night and I thought I know what I can do with that I can make it into a wallhanging. It was a lovely Indian piece of probably sari material and I thought I wanted something for that gap in the wall I had thought perhaps I probably would look out for something, no I thought no I can use that fabric it so beautiful I can bring something else in. Some ideas evolve with me as the quilt goes on, definitely. MT: It’s almost like pregnancy. MT: With this as the delivery. MT: The question, it says what do you spend money on for your quilting, but perhaps we won’t talk about? GC: No I am quite happy to. Books [laughter]. I love books although I really think I have got enough now. Quilt show fabric sometimes now perhaps I tend go for plainer things, for instance plainer range, I like those sorts of fabrics because they contrast with a lot of things. Threads interest you don’t they? MT: You’re buying less now much. It sounds like you’re much more thoughtful about what you actually require for work rather than being attracted by something sparkly or new. GC: I can go round a show. I went to Exeter Show they have a charity stall there with cheap fat quarters and they have wonderful colours and you sort of start knowing what you will use and what you won’t use, and I know there is a shade of yellow sort of oldie gold colour that I love and I can’t have too much of that. So yes, I tend to know what I like and I think I will use. I don’t waste so much now perhaps. I guess if you have a good stash, but then we don’t live in a town or a city so you need a good stash, you can’t just go out and get what you want. I have tried recycling, but I did not find it very successful because it was always getting the right weight. Sometimes what you thought was cotton wasn’t cotton and things like that. MT: We have to keep things on the road don’t we. When you go to a show or exhibition what do you look for when you are looking at somebody else’s work what sort of things. GC: This year I have actually gone to look at how people machine quilt. I went to Malvern and I took a lot of photos for my own use of how people were machine quilting their quilts. It is quite interesting because some people will do pattern all over some people will do certain parts of it. And I found it quite an interesting and very helpful exercise. So I suppose different year you look for different things but, I guess as you move on, but his year has been my, determined to get better at free machining, get better at free machining, I think I have, I think it is coming. MT: Well it looks very good, and this is a long time ago. GC: Actually I was quite good. It varies it is quite interesting I have got lines but I suppose I have but burnt the organza away, quite strong lines, and it is interesting I have not really used that technique so much. MT: It’s very effective for this and you have got very even stitching, not that I should be commenting. GC: I was quite impressed. I must have gone through a stage where I was not so happy with it but probably it is quite sqwirly, isn’t it so it goes over, which it is not the precise machine quilting that now I am trying to get perhaps but often this is the way. MT: You’re thinking, perhaps planning your quilting as opposed to patterns. MT: Its sky isn’t it. GC: It’s like when we when we learn to spin your first lumpy stuff the wool you produce is wonderful but it is very hard to produce it again. MT: I don’t know, I don’t spin. I have forgotten that you spin. GC: Some of this was, sort of, some parts is twisting and I do do a lot of twisting with threads and things, this was made into wool it was but I can put a twist onto fabric and things and use it sometimes. It is like all these things they come in, don’t they? MT: A little while ago in this discussion you were talking about the group you were teaching when I first met you, quite a long time ago now, you had been quite, not lacking in confidence, but you didn’t think you would kind of do anything. You suddenly kind of bloomed and I wondered how that had happened. You bloomed so far that you are how now got you’re now into your second year of teaching. I wondered how do you think that blossoming took part, how did it happen? 0:36:34 GC: The passion for quilting that was taking place I suppose Contemporary Quilt Group has help me a lot, because it does these challenges, doesn’t it? And it gives you an opportunity and I think take they take everyone’s work don’t they and they really do support you as a quilter. I can’t speak too highly. So I suppose that gave me confidence. I go to a craft group on a Wednesday night which has been going for a long time in our little village where you just get on with your own project, so we all support each other, and I suddenly found there were quite a few people were saying that they would like to quilt or they were looking at the magazines and I suddenly realised there was a demand for… to teach and I thought well it is the opportunity to do it really to get back a bit of money that I have spent on things. So it was a wonderful thing to do. I did six in the first lot only two at the second, so I did the second group at home, but that was a girl who was working so she has blossomed so well it is just amazing what… and she is young, she is wonderful she is in her thirties and she just takes it. She showed me this week she had done a Dresden Plate in pinks and greens and browns and just absolutely wonderful. GC: Yes I hope she will, but I think at the moment she is young, she’s got horse so she does not have that much money to spend, bless her. To me she is the future, which is good, but all the girls in the group, we now meet as a group once a month and they all love it, I think there is one possibly who’s not doing quite so much but the others, and they have all taken their own paths on it. Two are real traditionalists, there is a couple that do appliqué, and there is a couple more that do different projects, and off we go to the Malvern Show and things and we do these things and somebody buys fabric and they take it in and we drool over it. That was really good, but when you teach you learn as well don’t you and it is good because you go through what you have learnt again. You refresh yourself. MT: Do you see that group continuing do you think you will carry on teaching? GC: Not carry on teaching, but it will certainly carry on as a group, yes. MT: And what about teaching? GC: Where I live, I don’t probably see the need probably much more, I think I have probably left it too late to push myself further. MT: How do you mean. GC: I think I probably still see it more as, um, I think I can tick over how I am and I quite like that whereas if I wanted to push myself further to teach it is the next step up isn’t it and I think maybe I am quite happy at the level I am for the age I am because in two years I will be 70 and I think sort of… yes, I think it is a big step when you start putting your name forward for teaching and things on The Guild or taking classes. MT: It is a huge commitment and the prep work. GC: There is a lot more to it than just teaching and you have got to because you are satisfying people or trying to teach people who are as probably better than you perhaps. MT: What is the biggest challenge that you find with quilting today. Do you have challenges what is the most difficult? GC: Probably to stop ideas coming [laughter]. My brain can’t take any more! Yes I think so, I think we are very, very lucky with the quilt groups and things that we don’t have to hunt to find ways to exhibit and things, do we? So it is yes I think my biggest challenge was probably my Underground Quilt because that was a lot of responsibility really you have been chosen to represent your area so that was a big you just hope it comes up to standard. MT: For the purposes of the air play do you want to talk about that challenge? GC: Yes it was I think Region 12, well, all the Regions, had the opportunity to put a member, to suggest a member to make a quilt to celebrate 150 years of the London underground. 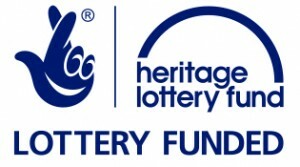 I was very lucky, I was asked and I did not really have to think about it really because to me it to me that was history, so I was able to go the London Transport Museum and do some research there and you sort of realise what’s important, and I travel quite a bit so I had used the underground and I had seen different stations being built for the Olympics and things, and you sort of see the new work at the Blackfriars one that has just come. You sort of get that, as I said, the up and down the steps sort of thing, rushing up rushing down. I mean some of the quilts were lovely there was one particular one of all people on the escalators. I mean it was fantastic really, really nice. It was just nice. It was nice to see how everyone else approached the subject. MT: So they were hung up at the? GC: Yes in Birmingham and as I said there was one whose machine quilting was out of this world, who had done quite pastel colours but more the map of the underground. There was somebody else who had painted a train coming through fast which was wonderful. It was fantastic. Really, really nice. MT: Good, and yours was about? GC: Mine was about the steps going up, going down and I broke it into, it was a triptych, of the first 50 years, the second 50 years and the last 50 years. I put ribbons across to show the lines that had been opened in each 50 years, which was quite interesting because there was actually less in think on the second lot than the first because some had combined and then obviously the last lot we had the Jubilee Line and I think there was another one. MT: So your piece has become a part of the Underground history hasn’t it itself because it depicted that so in another 50 years, not that we will be here, but we could put another piece. GC: Perhaps Tracey can put it on [laughter]. But obviously I loved doing it because obviously the first part was about the building of it. You had got horses that were actually bringing the carriages through to start with, and then I put a stamp on to show one of the royal weddings that was going on about the same time, so a little bit about ‘above’ a little bit about ‘below’ and Southwark Cathedral I put in two or three times because I thought it sort of. I don’t know whether you know Southwark Cathedral, but it nestles between two buildings on the sort of south side of the Thames it sort of peaks out I think it watches everything and I used it, and I just sort of and I put poem in it a lady I had met on the underground it old historian who was quite a character. That was a good way of bringing somebody who travels and somebody who knew about London in the Victorian age. MT: Back to your love of history and your degree and poetry. Do you find that very stressful when you are making that, when you are on a deadline? That was an important piece for you for the Region. Do you get stressed about this stuff? GC: Probably do but it is quite quickly forgotten isn’t it. I think the stress is getting the three pieces the same size and things like that and that they hang together. I think the actual… a lot of it is excitement you sort of think that I can put that on and I can put that on I remember Pat Meyer’s husband, Malcolm, is a railway enthusiast so he helped, he gave me some books to look at which was helpful. Yes. I don’t remember getting terribly stressed on it, but I think there was relief when I actually saw it hung it that it fitted in with everyone else’s it was part and I liked that, I thought ‘phew’ that you didn’t see something and think ‘oh I should have done that’. So yes it was very nice. MT: It was a lovely gallery. I must say the gallery looked lovely. The future? GC: The future? I am certainly going to do next JQs next year unless it is too restricted on what they decide to put in it. I think a friend of mine from Towy Quilters a Belgium friend she is going to do it with me I would like to persuade her to do it she has only recently joined Towy Quilters sorry she has been a long term member before me of Towy Quilters before me but only just recently joined Contemporary Quilt Group so I would like try and to do it with her we can push her not literally with her but both of us do it to get her going on something because it is a wonderful way of doing things. So that would be good. We have got Brecon next year that’s a nice nice opportunity to do something completely that you want to do. I have got a few ideas I have just got to I have cut out some fabric. So it is going to the next stage. MT: Quite a few things planned. MT: Anything else you want to say that I have not thought of. GC: No just that quilting, I just met so many friends through quilting and it’s just been wonderful obviously it is a very commercial thing now compared with how it started it was very utilitarian wasn’t it we needed them and you fill your quilt with everything from sacking I mean now you just go shopping for everything, interesting. MT: Well thank you very much Jill much for bringing your lovely piece of work, your sketch book and the CD and reading your poem and telling us about your life. It has been fascinating. GC: Lovely, thank you Millie.